Asking the people of Siddipet to draw an inspiration from Sakalajanula Samme movement, the Minister urged the Telangana people to join hands to defeat the Prajakutami. Irrigation Minister T Harish Rao during a road show in Siddipet on Wednesday. 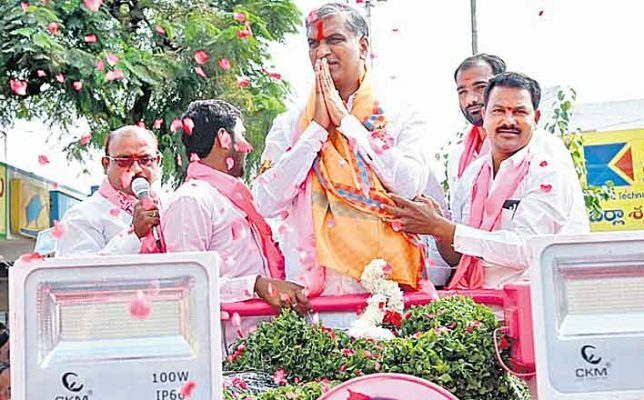 Siddipet: Irrigation Minister T Harish Rao termed the current election as the third Telangana movement since the TRS led by Chief Minister K Chandrashekhar Rao was fighting to protect the self-respect of the State. Stating that it is not about one party winning or other parties losing an election here, he said that people led by Telugu Desam Party president Nara Chandrababu Naidu have hatched a conspiracy to merge Telangana State with Andhra again. Asking the people of Siddipet to draw an inspiration from Sakalajanula Samme-kind of movements organised during the second phase of Telangana movement, the Minister urged the Telangana people to join hands to defeat the Prajakutami. Addressing an election rally on the last day of the election campaign here on Wednesday, Rao said that Naidu hatched a conspiracy to make Telangana government a puppet in his hands by forging an unethical alliance with Congress Party to pave way for the first step towards Telangana’s merger with AP. Urging the electorate to elect TRS supremo K Chandrashekhar Rao as Chief Minister for the second consecutive term, Rao called upon the people to take up the responsibility of keeping a Telangana leader in power. A massive rally was taken out covering all the important streets in Siddipet. Thousands of citizens and TRS party workers attended the road show. Harish also accused former MP Lagadapati Rajagopal of creating confusion among the people by releasing a fake survey. Accusing Rajagopal of acting at the behest of Naidu, Harish said that Rajagopal simply read out a script sent by Naidu to him. He further said that Rajagopal made last-minute bid to stall the formation of Telangana State by spraying pepper spray in the Parliament. Stating that Rajagopal was an agent of Naidu, Rao lashed out at the former Vijayawada MP for predicting the defeat of the TRS.